The web provides an incredible amount of information about the game of golf. I am continually adding links to my blog to make it easy for our members to stay well informed. Be sure to check in often! Stay in contact with the latest reports in the Northeast. The USGA Turf Professionals provide these reports. The Farms Country Club's Green and Grounds committee is very familiar with this link. They have been using this informative resource for years! The USGA Green Section provides periodic reports of what is going on in "Our Neck of The Woods". The following link is an opportunity for you as a member to stay more informed as to general and specific conditions and/or maintenance practices that may effect your country club. This is an invaluable resource for all of us! The link to this site can also be found in the permanent link category on the blog. Ed has been the head equipment manager at The Farms Country Club since April of 1996. 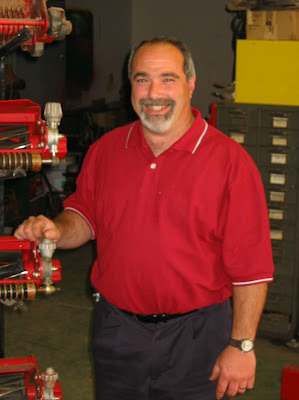 Ed is one of the premier golf course equipment manager’s in the state of Connecticut. He originally entered the trade from the business of automobile mechanic. He quickly picked up on the intricacies of maintaining a two million dollar fleet of high performance equipment. Realizing swiftly that there is really no mechanic job that can completely prepare someone for this type of position, he began to attend many specialized classes pertaining to the types of equipment within his charge. To go one step further, he wanted to broaden his ability in the turf field. He applied and was accepted into The University of Massachusetts’s Turf Management Winter School in 2002. This is an accelerated program in which students get an eight week crash course in maintaining and caring for specialty turf in a golf course environment. Ed has been tireless in his efforts to continually improve his abilities and expand his knowledge of all facets of the business. I’m proud to introduce Ed Smeriglio. Without his superior knowledge and effort we would not consistently be able to maintain the golf course and grounds to the level we are accustomed to. Make it a point to stop him and say hi.